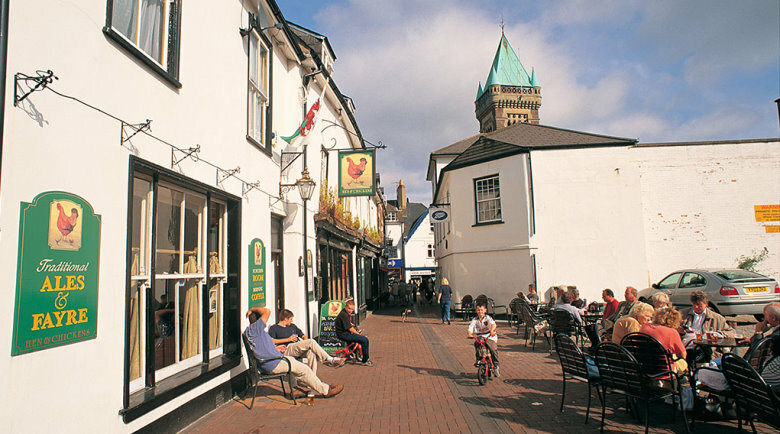 Abergavenny, due to its location and easy access to the Brecon Beacons National Park and the nearby Black Mountains, is often referred to as the ‘Gateway to Wales’. 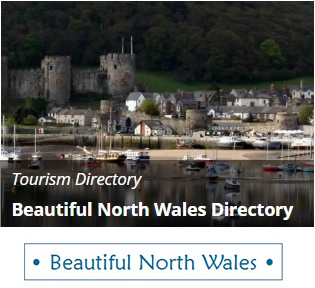 The town is also close to Offa’s Dyke and various walks such as the Usk Valley Walk. The origins of the Monmouthshire town of Abergavenny (in Welsh meaning ‘Mouth of the River Gavenny’) can be dated back to the location of Gobannium, a Roman fort on the site in around the 2nd century AD to guard the road that linked the fortress of Burrium in the south with the Brecons and mid-Wales. It also served to subdue the Silures, the indigenous Iron Age tribe. Remains of the walls of this fort were discovered during excavations in the 1960s when foundations for a new post office and telephone exchange building where being built. The fort’s name, Burrium is understood to be derived from a Brythonic word Gobannia meaning "river of the blacksmiths", and relates to the town's pre-Roman importance in iron smelting. Abergavenny was also a walled town during the medieval period, which complimented the medieval castle built there soon after the Norman conquest. It grew as a town in early Norman times under the protection of the Lords of Abergavenny with the Benedictine priory, now the Priory Church of St Mary, founded in the late 11th century. This Church contains some unique alabaster effigies, church monuments and unique medieval wood carving, such as the Tree of Jesse. 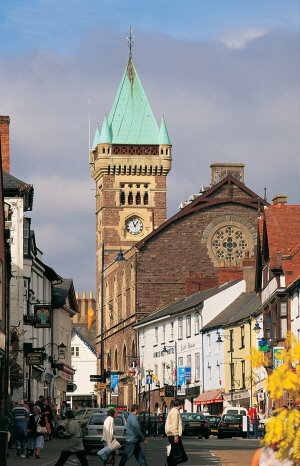 Due to its geographical location, Abergavenny was often involved in border warfare during the 12th and 13th centuries. 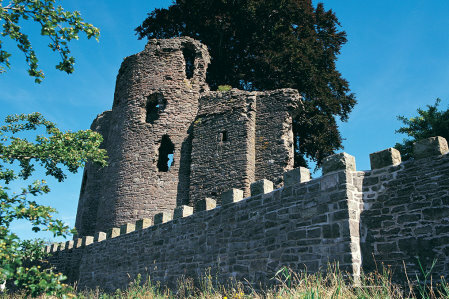 In 1175, its castle was reputed to be the scene of a massacre of local Welsh chieftains by the ruthless William de Braose, who following a period of conflict invited the local leaders to a Christmas banquet saying he wanted to resolve the differences but rather his plan was to eliminate them. By accepting this assumed hospitality and proffered their swords as tokens of peaceful intent the soldiers of William de Braose subsequently killed them in cold blood. In 1404, Owain Glyndwr attacked Abergavenny with his raiders gaining access to the walled town with the aid of a local woman who sympathised with the rebellion. This woman then let a small party in via the Market Street gate at midnight who then opened a gate and allow a much larger party who set fire to the town and plundered its churches and homes leaving Abergavenny Castle intact. Market Street has been referred to as Traitors' Lane thereafter. In 1404 Abergavenny was declared its own nation by Ieuan ab Owain Glyndwr (The illegitimate son of Owain Glyndwr), however, the arrangement lasted only two weeks. It was in 1639 that Abergavenny received a charter of incorporation, which was extended with privileges in 1657. It is interesting to note that the charter, however, never to have been enrolled or to have come into effect due to the refusal of the chief officers of the corporation to take the oath of allegiance to William III in 1688. 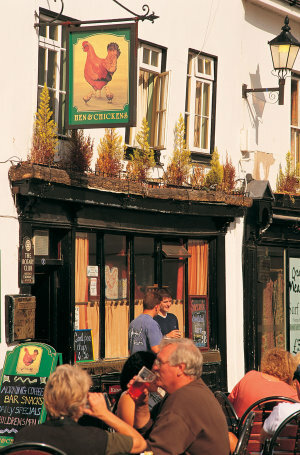 This resulted in the town subsequently declining in prosperity. A study of records shows that between 1794 to 1894, Abergavenny’s Improvement Commissioners, who were all freeholders of property in the area, took control of the affairs of the town. This resulted in many improvements that made the town as we know it today. The old market hall built in 1602 was rebuilt, streets were paved for the first time and a police force was provided. The commissioners also constructed an entirely new water supply system from a reservoir already in use in Pen-y-pound. The pipes were made from Elm originally before being replaced with iron pipes in 1813! The construction of a gas works in 1823 and the present cattle market in 1863 were notable dates in the history of the town along with a new water reservoir in 1860 and an efficient sewage disposal system shortly after. The present town and market halls were built in 1870. In 1894 the commissioners handed over their functions to the newly ceated Abergavenny Urban District Council. The local government reorganisation of 1974 meant that most of the functions of the old borough council were taken over by Monmouth District Council.